Last year, the Queensland Public Trustee prepared 28,272 wills for Queenslanders in Australia. They are also the largest will-makers in the Southern Hemisphere and the biggest Public Trustee in Australia, which has eight Public Trustees – one for each of their state and territories. “It has been 102 years since the Queensland Public Trustee was established and we have been around for 88 years. 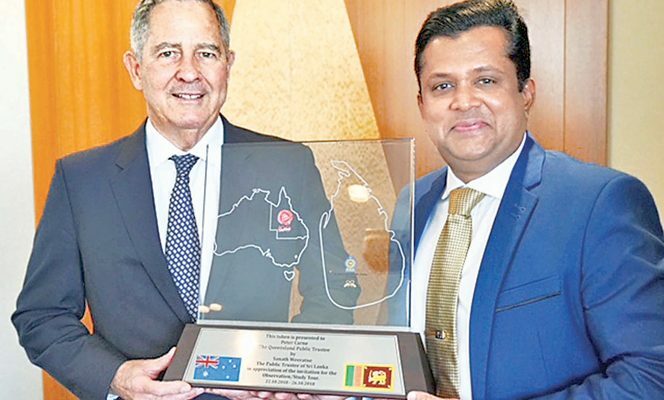 Though we were both established around the same time and have a similar population, they have far outstripped us,” said Sri Lankan Public Trustee Sanath Weeratne. He undertook a study tour of the Queensland Public Trustee in October of this year and held discussions with the Queensland Public Trustee Peter Carne to understand ways in which our own Department can be improved. Even if we can incorporate one percent of what they do, we would have achieved something, he added, speaking in an interview with the Daily News. The differences between the Sri Lankan and Queensland Trustees however are too many to count. If the latter have invested in air-conditioned and fireproof underground bunkers to keep all their wills safe, the local office keeps them all in a cupboard at the home of late D.B. Jayathilaka on Bauddhaloka Mawatha, the office of the Public Trustee. Last year, however, Weeratne managed to get fire extinguishers to ensure the wills since 1930 were somewhat safe. 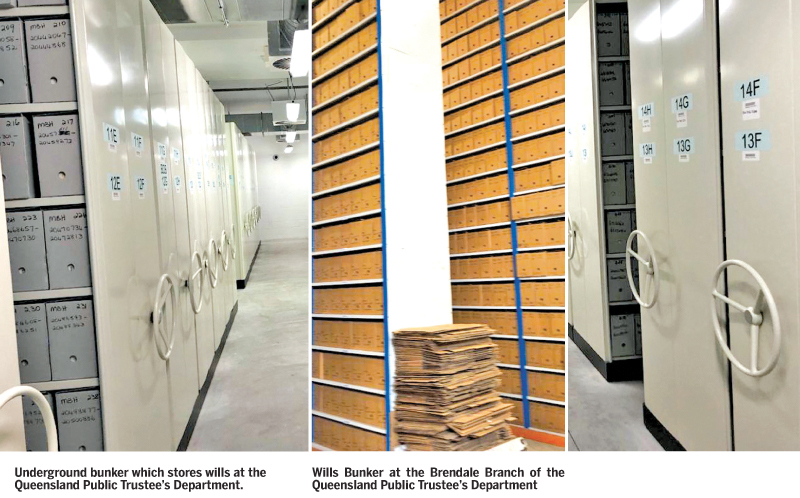 The Queensland Public Trustee is also looking to go digital and soon will not have to keep stocking perishable paper wills. Weeratne in the meantime explained that they still needed to get their accounting and workflow software sorted. Despite these obvious challenges however, Weeratne is optimistic that the biggest takeaway from his tour of Queensland should be their emphasis on proper systems. “There is no magic to what they do, they just have proper systems and protocols in place. And that is what we need,” he said. Having studied the current organisational structure of the Queensland Public Trustee, their workflow, the manner in which they are integrated with other public services, engagement between regional offices, an overview of the laws, practices and regulations related to the Public Trustee and the ways in which procedures and systems are put in place to increase public engagement with the Public Trustee through digital platforms, Weeratne spoke of how some of their systems could be implemented into the Sri Lankan Public Trustee’s Department. Eighty percent of our problems would be solved with the proper and trained staff, he said. Weeratne has also requested that their cadre numbers be increased from the current 87. The Queensland Public Trustee employs close to 600 staff to carry out its duties and whilst the Sri Lankan counterpart has not expanded its business activities to the extent of Queensland, Weeratne said they were severely short-staffed and an expansion could be supported better with more staff. His expansion plans mainly revolve around opening up more regional branches. At present, Sri Lanka only has one office in Colombo, but Weeratne believed that they could dramatically increase their portfolio if they were more accessible to the people through their regional branches. The Queensland Trustee has 15 branches and today, administers an asset portfolio worth US$ 2.7 billion. Sri Lanka, in the meantime, has an asset portfolio of Rs. 3 billion. “We need branches at least in Jaffna, the South and Kandy, so people can get to know what we do and come to us,” he said. For the last 88 years, the focus of the Sri Lankan Public Trustee has been limited. They have mostly been satisfied with managing estates or property of individuals who come to them and have them execute and manage their wills. Weeratne however says that this is a department with much more potential. In Queensland, the Public Trustee not only offers a ‘free will-making service’ but also conducts awareness programmes through ‘Will Week’ to have more people sign up. In addition they also undertake executor services, manage Enduring Powers of Attorney (allowing the elderly to nominate who would manage their affairs when they are incapacitated or no longer able to), manage real estate, help people with applying for income tax returns, and manage trusts. It is a long walk for us, but we have to start somewhere, said Weeratne. The more wills the Public Trustee can make, the more beneficial it is for the country’s economy, he said, as unused lands and property can be put to the best use for the general public after a person passes away. One of the best lessons to take from the Queensland Public Trustee Department however was its integration with other public services such as the Office of the Registrar of Births and Deaths, Marriages, etc. This meant that whenever the person whose will the office was managing passed away or had a life-changing incident take place, the Department is instantly notified and their will can be looked into. This is of special significance to the Sri Lankan Public Trustee’s Department which found out this year that there were 252 unopened last wills since the 1930s and they did not know whether the owners had passed away or not. “If we can come up with a way to connect the Registrar of Birth and Deaths, Department of Immigration and Emigration, and all other government departments in one system, we would be easily notified when things change. Now we have to go to court and go through a lengthy court process to figure out what to do with these wills,” said Weeratne. The Queensland Public Trustee also collects all financial information, from the individual’s tax file number to the loans and debts the person may have incurred and even medical records (if acting as an enduring power of attorney) when making his or her will. Thus a will prepared in such a comprehensive manner is less likely to be challenged in courts, explained Weeratne. If the Sri Lankan Public Trustee can revamp successfully, it would also help tackle many of the property issues families in Sri Lanka go through. The encouragement towards having people write a will is can be positive and not only increase the state’s assets, but also ensure that there are few families that break apart after a wealthy family member passes away.